One of the first sweaters I made, for my then-7-year-old son, was in Noro Kureyon. He loved the colors but it was a tad scratchy, and after he grew out of it, I couldn’t find any child that would love that sweater like he did. Noro has always been the gold standard for eye-catching, long color repeats and brightly-hued blues, pinks, reds, and greens. At least, I thought that’s what I loved about Noro yarns. What did I spot in one of my hoarding window-shopping expeditions into the store? 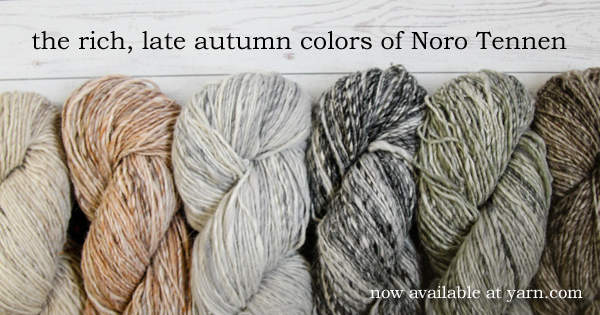 Why, Noro Tennen, a gorgeous blend of wool, silk, and alpaca in colors evocative of nature in late November. 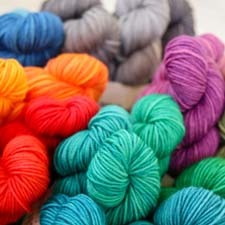 The color names bring to mind images of stone, smoke, wood, and salmon, and the yarn brings those images onto your needles. Each worsted-weight skein is a very generous 275 yards, making the possibility of a hat, cowl, ear-warmer, or fingerless mitts out of one of those skeins very real. But I think this slightly fuzzy, rustic yarn demands a sweater, and our Shay Cap Sleeve Pullover would be perfect to show off the muted colors and unique texture of this special yarn. Perfect to throw on over a slim long-sleeve shirt or under a heavier jacket, Tennen will be a savvy investment for moments of quiet, contemplative stitching. This entry was posted on Friday, October 28th, 2016 at 8:19 am	and is filed under Products at WEBS. You can follow any responses to this entry through the RSS 2.0 feed. You can skip to the end and leave a response. Pinging is currently not allowed.